We are a diverse group of people of different ages and backgrounds who are brought together day by day and week by week, as we recognize God’s love for us all shown in Jesus Christ. YOU are welcome to join us through our webcasting or if possible in person. This website is our front door and there is a lot of information here; including a photo gallery, an in-depth history, a news section, and much more. You can also submit prayer requests to be offered at our times of Eucharistic Adoration. 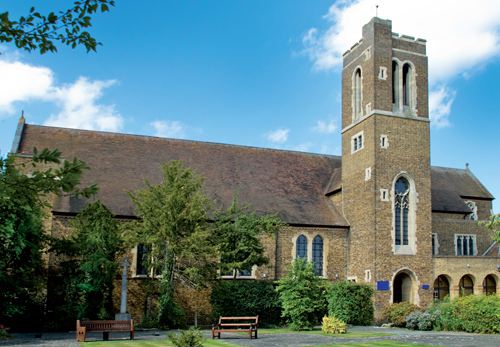 Since it was built in the 1930s, St Mary’s has been a traditional parish church. Everyone is welcome and included. However, for theological reasons, we are unable to accept the priestly or episcopal ministry of women. We are a parish within the Church of England diocese of London, under the leadership of Bishop Sarah. We look to the Bishop of Fulham the Right Reverend Jonathan Baker, for sacramental and other support and ministry. Pastoral enquiries concerning Baptism, Marriage or Confession, or other needs, may be made after services (see the calendar for times), by email, or by phoning us on 020 8907 2914. Share in our worship and watch all our services live on this site. You can also take a virtual tour and explore the Church for yourself. St Mary’s sadly announces the death of one of her much loved parishioners. Sermon 5 – Why do we pray to the Saints? Lent Sermon 4 – Why is Our Lady so important?